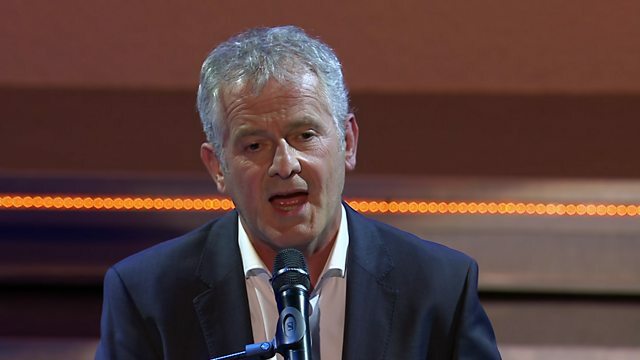 Garry Owen sy'n cymryd yr awenau yng Nghaerfyrddin. With Huw Chiswell, Emyr Wyn Jones, Aled & Eleri Edwards, Sam Jones, Lleisiau'r Cwm Choir, Empty Pockets & Ysgol y Dderwen Choir. -in the BBC for the evening. -on the famous Noson Lawen stage. -The audience are in their seats. -So, sit back and enjoy. -Dave and Andy are their names. -off and on since the 1980s. -Best wishes to you. Thank you. -radio presenter and a journalist. -to be. What do you think that was? -the dream was for Garry Owen? -The clue's in the name. -My dad was a big rugby fan. -I was going on the rugby pitch. -but Mam-gu was also determined. -wanted me to go to eisteddfodau. -Who do you think won that battle? -I'd go to local eisteddfodau. -I still use to this day. -have been to a few eisteddfodau. -We are Cor Ysgol y Dderwen. -from the Nia Ben Aur musical. -you looking forward to performing? -Many thanks to Ysgol y Dderwen. -"He or she was in school with me"? -I'm going to do that now. -and the Noson Lawen band. -about a crumbling street corner? -audience here in the Lyric. -..who've won the Blue Riband. -I won my Blue Riband last century! -I won mine in 1997 in Bala. -might come along one day. -has his and hers towels. -We have his and hers Blue Ribands! -# Can you hear me? -Thank you, Aled and Eleri. -Any of you? I thought so. -Fair play. You enjoyed it then! -as much as the next man onstage. -I think he enjoyed himself too much. -Please give him a warm welcome. -What's going on here, then? -catching up with the horses. -They were going much too fast. -the next they were there. -It made me all giddy. -at ten in the morning. -..was to go to the bar. -we had no chance during the day. -saw something very strange today. -..with a coffin on their shoulders. -Dilwyn was in a panic today. -I'd never seen him like this before. -for a pint on our way there. -I said, "Dilwyn, what's wrong?" -He said, "Damn, damn, damn! -I said, "Why do you say that?" -We'd stopped to withdraw some cash. -was trying to get money out. -can you help me, please? -"Can you help me check my balance?" -So Dilwyn pushed her over! -of a story I'd heard. -You'd never guess what he does now. -He is Donald Trump's chauffeur. -..with Donald Trump in the back. -"..to say you've killed the pig." -In one hand, he had a wad of cash. -In the other, he had champagne. -He had lipstick all over him. -He went back to the car. -where the hell have you been? -have you been saying to them?" -because Dilwyn's in the car. -He'd hoped to meet someone. -"Have I seen you somewhere before?" -I'm not going there again." -Oh! What can I say! -don't accompany him to Ffos Las! -The Lyric Theatre in Carmarthen. -have performed here over the years. -has written some delicious melodies! -it. Gary Griffiths too, I'm sure. -It'll be my version tonight. -It's at the heart of Carmarthen. -That heart is beating fast tonight. -so a happy birthday to them. -by Robat Arwyn and Tudur Dylan. -for them - Lleisiau Mewn Cynghanedd. -Catrin Hughes is the conductor. -Catrin Hughes. Cor Lleisiau'r Cwm. -and a happy birthday to you. -this one's a talented bloke. -He's a singer and a pianist. -But he has a hidden talent. -I won't say any more. -yodels to Aros Mae'r Mynyddau Mawr. -Probably. In the middle part. -Hold on, you'll be better than me! -is the next song I'll be performing. -the Swansea Valley back to Cardiff. -that go through one's mind. -Many thanks to Huw Chiswell. -why he's one of our greatest stars. -Thank you very much, Huw. -We've come to the finale. -Un Ydym Ni is the name of the song. -Cor Lleisiau'r Cwm will sing it. -Emyr Wyn Jones is the soloist. -that will echo throughout Wales! -We enjoyed every one of them.